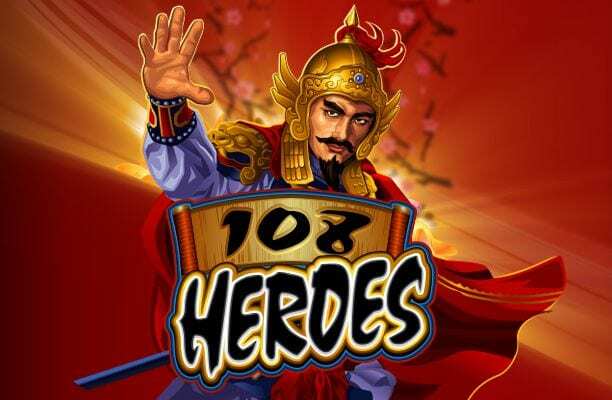 Adding to the extensive list of Chinese themed games, 108 heroes tries its best to add some further value to the much-practised genre. 108 heroes has a martial arts type vibe and this is apparent in the soundtrack. Spin and deposit today on this oriental online slot game and find yourself progressing through the ranks to have a spin on the King’s treasure bonus. If you're up to something more fun, click to view UK slots on our homepage! As one of the oldest and most recognisable names of online games developers, Microgaming can trace their road to success all the way back to 1994 when they launched the Gaming Club, their first online casino. This veteran developer offers a range of favourite online casino games such as blackjack, sic bo, baccarat and many more. Specialising in online slot games, Microgaming boasts 300 different slot game titles, and what makes them stand out is that each is highly graphical and expertly themed. We have all the best online slot games from Microgaming here. Based on the semi-historical novel Shui Hu Zhuan (Water Margin) by Shi Nai’an, this Eastern story is comparable with Robin Hood. Hidden in the margins of Liangshan Marsh near the Liang Mountain, these 108 rebels took an oath to protect the poor and unfortunate. Men and women fought shoulder to shoulder performing audacious robberies on their feudal overlords and giving their stolen riches to the poor. You are invited to walk the path of these 108 brave heroes in this online slot best games through an Eastern journey filled with danger, adventure, and rich rewards. This Far Eastern themed online slot game has 5 reels, 3 rows and 15 paylines with beautiful cherry blossom trees in the background. Thematic symbols include four male warriors, one female warrior and your traditional playing card symbols of A, K and Q. You’ve got 15 chances to make a winning combination from the left side of the reel to the right side and when you do your winning combination symbols will come to life for you in a stunning display of animation ingenuity. You can start your bet at 15p up to £75 per spin. You can set your coin value at 1p, 2p, 5p, 10p, 20p, 25p, 50p and £1 with 5 coins at hand. The Max Bet option is found in the betting grid and you also have an Auto Play function on the slot grid which will allow you to choose between 10, 25, 50 and 100 games to play. The 108 Heroes Logo is your Wild symbol which will substitute for all symbols except the Bonus and the Scatter symbols. The Scatter is the Liang Mountain symbol which will trigger the Free Spins feature and the Bonus is the Chest symbol. To trigger the Free Spins feature you will need to land 3 or more Scatter symbols anywhere on the reels. Not only will you be rewarded with 10 Free Spins but also a multiplier of 3x your wins during the bonus Free Spins! The Kings Treasure Bonus is activated when you get 3 or more Chest symbols on the reels of an active payline from left to right. 3, 4, or 5 matched Chest symbols will reward you with 3, 4, or 5 prizes to pick from. You will be taken to a screen where you have 12 chests full of treasures, drag them out from the van to reveal your prizes! 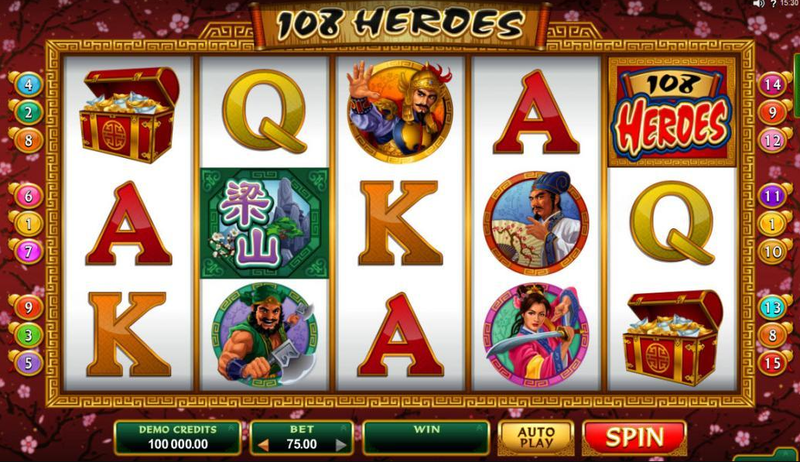 108 Heroes is visually stunning and entertaining with its theme. You’ve also got some impressive payouts, free spins and bonus features which make this superb online slot game from Micrograming difficult to fault. Another great game to try is Wild Wild West slot.